There is a reason that Halloween is such an iconic horror movie. The moment that theme starts, before any actual images appear on-screen, the chills begin to creep-up your spine. It sets the tone for the cold, unique opening as we watch a murder in the first person and get a great reveal when the actual killer is unmasked. The tone and setting for the movie is established and one of movie’s greatest villains is born. Michael Myers is an icon of cinema. The inside-out William Shatner mask adds a great creepiness and although you are made aware that he is a psychopath and a killer: the constant mentions of him being a boogeyman only raise the fear factor. Director John Carpenter also crafts some of the best imagery. It begins with a mental asylum that has clearly been breached and then the numerous shots, each as creepy as the last, of Michael Myers in the background of a scene, waiting and stalking. This film contains so many of those scenes and each one has the shuddering impact desired. It is also great to see the killer revealed in daylight too. The bed-sheets bellowing around him or Myers disappearing behind a hedge are all moments used to raise the tension. 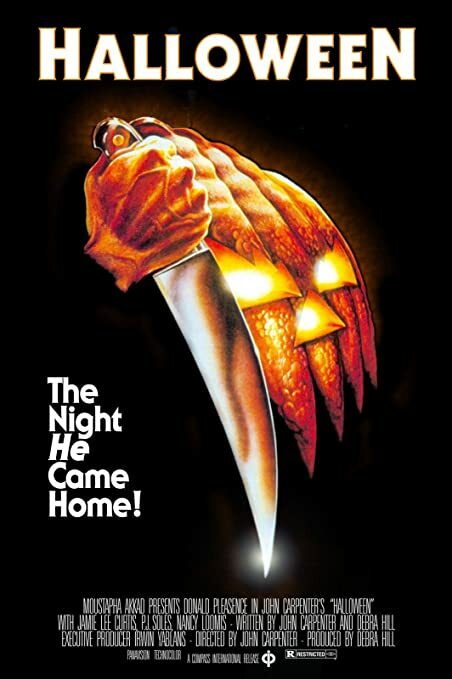 Aside from the scene-setting kill of the first ten minutes, it will be at least forty-five minutes before Myers gets a knife and starts killing babysitters and horny boyfriends. When he does, the tension is under-cut slightly. This is a movie where the build-up is better than the pay-off. You could argue that Halloween is dated because the scares are fairly tame, as are the kills, which surprisingly for a slasher movie, come few and far between. It is when the movie and the killer focus on heroine Laurie that it begins to grab you again and that chill returns. Halloween is the reason movies like Scream exist and it arguably helped establish the cliche’s that Wes Craven’s meta-horror highlighted. Jamie Lee Curtis makes her movie debut as the nerdy babysitter who becomes the target for Myer’s horror. She is a stable, screaming teenager and makes all the stupid mistakes that you’d expect from classic horror. What it leads to is more amazing Myers though, as he becomes the unstoppable and seemingly un-kill-able threat that will go on to inspire many more sequels. Overall, the blueprints for effective horror are all here. Halloween has a great theme, an amazing killer with an iconic look, and all the dumb teenagers you could ask for. In this respect it is also dated, with the actual slashing leaving you fairly underwhelmed. Previous Previous post: Horror and Zombies Month: The Launch!